IdiomaX Translation Assistant is, together with Babylon, one of the best translation applications that can be found on the market, not only due to how easy it is to use, but also due to all the dictionaries that it integrates and the languages with which it is compatible. This tool can be used to translate between English, Spanish, Italian, French and German. How the program works is very simple, we copy the text that we want to translate to the clipboard, we open the programs interface, we paste the contents and we wait for it to give us back an adaptation to the language of our choice. 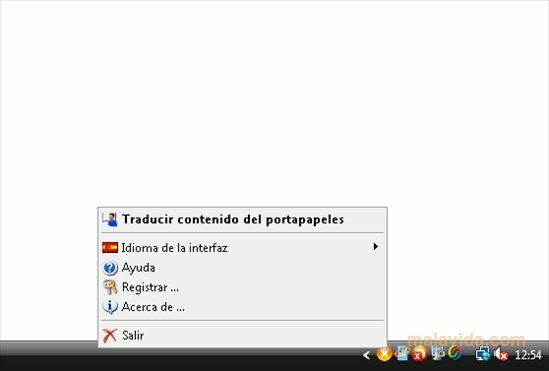 It also has a single word translator, in which it will also show synonyms, and a collection of specialized dictionaries (economics, medicine, computing,..), that will help us with more technical words. The interface is very simple, thus making it easier to use the tool while we work on any kind of document. If you were looking for a program with which to be able to translate between four of the most important languages in the world, try IdiomaX Translation Assistant.